its match in Richard Lasseter's big, bad Buick GS. Under normal bench racing circumstances, the Hemi Mopar and the Buick GS aren't mentioned in the same conversation. The race-bred 426 hemispherical heads built its legendary reputation on America's drag strips and Woodward Avenues, while the Buick's reputation was on of old men and country clubs. When you think tire-burning Mopars streaking toward the traps at the end of a quarter-mile. But when you think Buick, you think about the four door your dad owned when you were a kid. Hardly a fair comparison, right? So why are we throwing a Buick GS up against a Hemi GTX in our first Supercar Shootout? ARe we sadistic or something?. Not really. If you recall, the 1970 Buick GS 455 Stage I claimed the third spot in our November 1984 "Fifty Fastest Muscle cars" article with a 13.38 - second quarter - mile from 1970 Motor Trend road test. The quickest Hemi car, a 1968 Charger, claimed the fifth spot with a 13.50 - second quarter - mile from a late 1967 issue of Car & Driver. That's a difference of only .12 - second, but we're talking serious bench racing here. has finally been shattered!"). To hopefully settle this debate between the Hemi and the Buick, we invited both men to our premier Supercar Shootout. By coincidence, Badie lives in Clearwater, Florida, and Lasseter lives in Valdosta, Georgia, both within easy driving distance to Gainesville Raceway. The race was on. On muscle looks alone, the Hemi wins the contest hands down. Badie's was stone stock except for headers and a blueprint camshaft. It was a match made in musclecar heaven; the famous Hemi versus the underdog Buick Stage I. 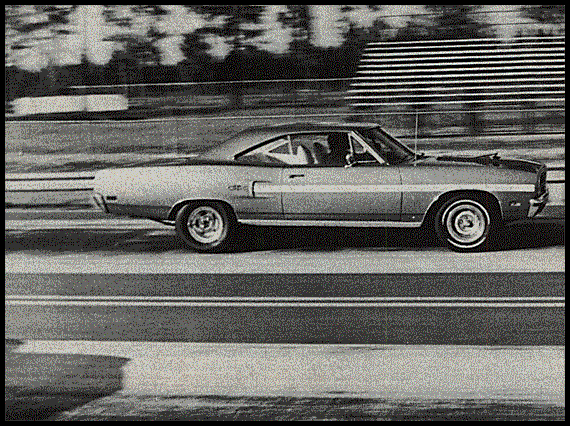 Due to the Hemi's illustrious history, we knew Badie's 1970 GTX would be fast, no question about it. But Lasseter had a point to prove. Was his 1970 Buick GS Stage I as fast as the Motor trend road test claimed, or did it run like it was tied to a tree, like Badie claimed? Gainesville would tell the tale. At first, we thought we had an equal pairing. 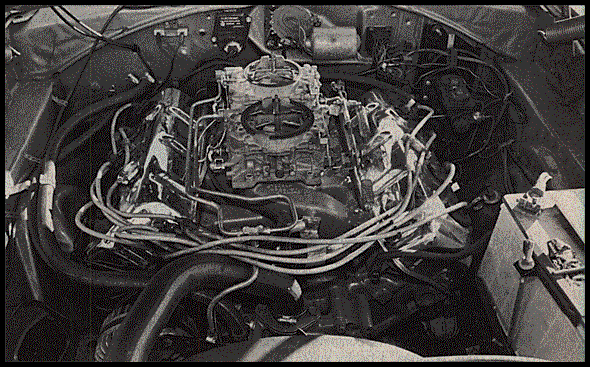 Badie's GTX was equipped with headers and a "blueprint" street cam; Lasseter's Buick GS also had headers Aden a "blueprint" street cam, plus and Edelbrock intake manifold and Holley 700 cfm four - barrel. We didn't complain about the Buick's intake modifications because the 700 cfm of the Holley closely paralleled the cfm rating of the Stage I's original Quadrajet, and because the Hemi still held a breathing advantage with its dual Carter AFBs (1,250 cfm). Lasseter had also clipped the compression ratio during a 1980 rebuild, so the carb and manifold mods, he said made up for the lost power. The GTX held the drivetrain advantage with a four - speed and 4.10 gear; the Buick would make do with a Turbo Hydro -Matic and 3.42 gears. Both owner agreed to run slicks. The 455 Stage I Buick engine may not look as big or as impressive as the Hemi, but our drag race numbers tell us that Lasseter's 455 puts out some impressive horsepower. Oddly, Lasseter dumped the original ram air setup for an open element unit. mag - mounted slicks because the GRX's lugs were too short. Panic set in, but out of nowhere a Hemi 'Cuda rolled into the pits with a a set of slicks mounted on chrome reverse rims. Yep, we could borrow them for the shootout. For once, Lady Luck was on our side. But unfortunately for Badie, the replacement slicks were taller and skinnier than the ones he originally intended to use. and the Supercar Shootout would be his first try with the car on a drag strip. Lasseter, however, purchased his Stage I Buick GS brand new in 1970, so he had about fourteen years worth of GS experience under his Buick belt buckle. We also discovered that Lasseter frequently enters his GS in NHRA "stock" competition, so he and the GS were no stranger to drag strip competition. Both cars traveled 130 miles to the Gainesville track, but Badie elected to trailer the GTX while Lasseter drive the Buick. In the pits prior to the first run, Lasseter's drag racing experience emerged. 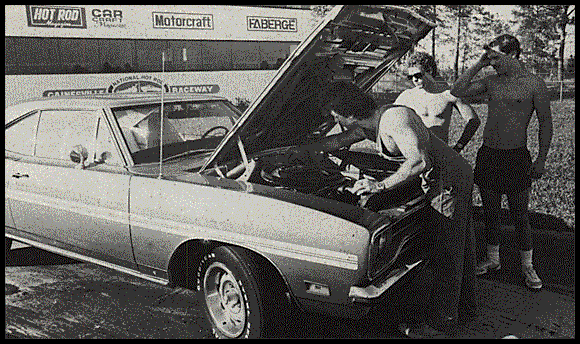 While Badie and a singe helper were swapping the slicks from the 'Cuda to the GTX, Lasseter's "pit crew" attacked the GS. bolting on a set of slicks that looked like Pro Stock equipment, swapping spark plugs and dumping ice on the intake manifold to cool down the air-fuel mixture. Obviously, Lasseter knew what to do to make the Stage I run. Badie, on the other hand, never touched the Hemi before the race. Based on American musclecar history, the Hemi was the odds - on favorite to win our first Supercar Shootout. Introduced in street form in 1966 for the PLymouth Belvedere and the Dodge Coronet and Charger, the 426 cubic inch Hemi engine soon became the standard by which all other musclecar motors were measured. Based closely on the racing version, which dominated NASCAR roundy - round and professional drag racing during the mid - to - late - sixties, the street Hemi retained the race engine's heavy - breathing hemispherical combustion chambers, huge valves (2.25 - inch intakes and 1.94 - inch exhausts), and bullet - proof bottom end. With dual Carter AFBs, Chrysler rated the street Hemi at a very conservative 425 horsepower. According to the road tests from our "Fifty Fastest" survey, stock Hemi - powered Mopars, from Chargers to Challengers, consistently ran the quarter - mile in less than 14 seconds on street tires. If ever a street motor deserved the "legendary" label, it is the 426 Hemi. Which brings us to the Buick Stage I. Lacking a racing heritage and street performance reputation like the Chrysler Hemi, the 360 - horsepower 455 Stage I failed to attract a large following of musclecar enthusiasts, probably because the Stage I motor was wrapped in an "old man's" Buick body. 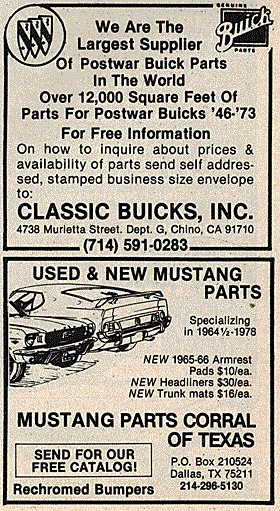 But the enthusiast magazines of 1970 quickly jumped on Buick's Stage I bandwagon: "The first time you put your foot to the boards a premonition of impending whiplash eminates from the base of the Achilles tendon," said Motor Trend in January 1970. "...it runs the quarter in 13.38 at 105.50 miles per hour, Stock." 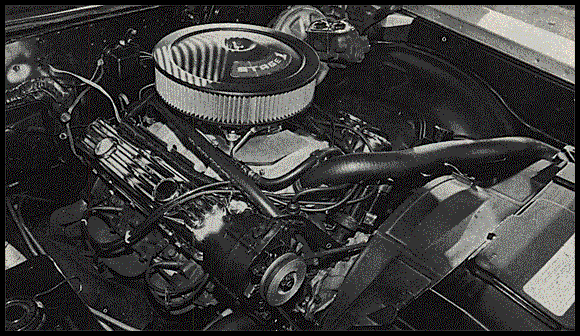 A new performance edition in 1970, the 455 Stage I package added specially- machined cylinder heads with oversize valves (2.120-inch on the intake and 2.0-inch exhaust), higher lift and longer duration camshaft, quick - curve distributor, Quadrajet four - barrel, and numerous other miscellaneous performance bits and pieces. Not bad for an old man's car, huh? Back at the strip, Badie requested a shake - down run to familiarize himself with the GTX's launching abilities. To be fair, we offered Lasseter the same opportunity, but he declined in favor of keeping his 455 engine cool. After watching Lasseter at Gainesville, we're convinced that one of the keys to making a 455 Stage I run is to keep it cool, as evidenced by the ice on the manifold and Lasseter declining the shake - down pass. After smokey burnouts, both cars staged, Badie's GTX in the tower lane and Lasseter's Buick GS in the spectator lane. Through street exhausts, but the Plymouth and the Buick sounded like a couple of cars idling at the corner red light, but when the lights came down and the tree turned green, these innocent sounding street cars transformed into street - legal road rockets. Thanks to his drag racing experience, Lasseter pulled an impressive hole - shot, and the Stage Is' power kept the Buick in the lead for the quarter - mile duration. The voice over the loudspeaker would give the times: "The Plymouth ran a 13.34 at 106.63 miles per hour." Wow, we thought, that's pretty quick. "The Buick ran a 12.49 at 108.56." Oh, what have we wrought? "That's one bad Buick," said one of the Moparites in the pits. In the first run, Lasseter's GS jumped out to a big lead. 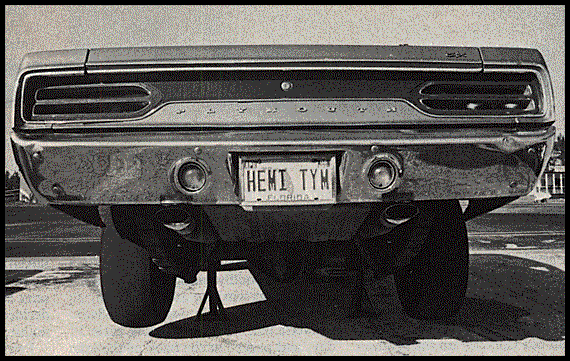 Badie's Hemi GTX never caught up. After loosing the first round, Badie retreated to the pits and removed the air cleaner element to hopefully pick up a few extra horses. Meanwhile, the rest of the Hemi faithful stood around scratching their heads in wonder. After the first run, both drivers registered minor complaints. The Hemi bogged off the line when the second carb opened up, said Badie, and Lasseter had the guts to apologize for his "slow" time due to fuel percolation. After a 30 minute cool - down period - more ice on the Stage i's intake manifold - and removal of the Hemi's air cleaner, the two warriors switched lanes and lined up for a second confrontation. It was put up or shut up time for the Hemi GTX. Badie gave it his best shot by launching the GRX first, jumping to a quick half car length lead. But Lasseter's blue Buick bombshell, showing off its definite horsepower advantage, caught the Plymouth in second gear and cruised to a two - out - of - two Supercar Shootout victory. The GTX registered a lighting quick 13.03 at 107.14 miles per hour, but to the amazement of everyone except Lasseter and the rest of the Buick faithful, the Stage I GS improved its earlier performance by running a 12.30 at 110.97. Holy upset! In round two, Badie launched the GTX first. But at the other end of the quarter mile where it counts the most, Lasseter was first with a 12.30-second elapsed time. So what did we prove at our Supercar Shootout? 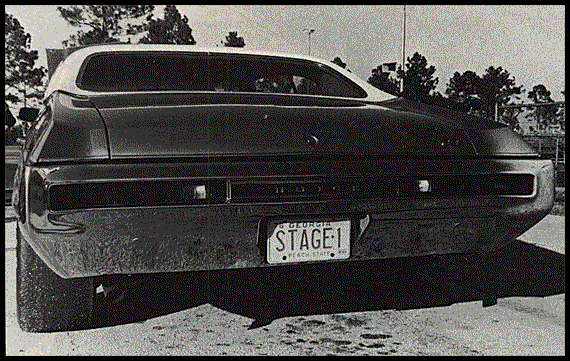 For one thing, Richard Lasseter proved that his 1970 Buick GS Stage I runs faster than a car tied to a tree. In fact, Lasseter's Buick could probably uproot a south Georgia Pine. Lasseter obviously Knows the right combination to unlock the stock Stage I's power potential, and we'll venture to say that only a handful of other stock Stage Is out there could keep up with Richard's GS. 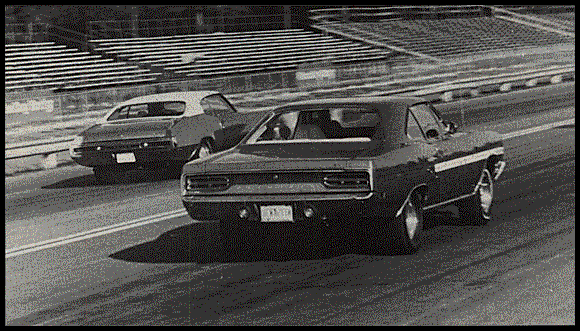 Mopar lovers can cry "Foul!" if they wish - due to the Holley carburetor, Edelbrock manifold, and obviously lowered front end - but you can't discredit a street car that you can drive 130 miles to a dragstrip and immediately knock off an elapsed time in the mid - 12s - with the power steering hooked up and working, no less. Badie has nothing to be ashamed of. Of the two competing Shootout vehicles, the Hemi GTX was the more original of the pair, with only headers and a blueprint cam deviating from stock condition. A 13.03 quarter - mile elapsed time is nothing to laugh at either. With a little more drag racing experience behind the wheel of the GRX and the right slicks, Badie could probably lower his times well into the high 12s. That alone says a lot for the raw power capability of the stock Hemi Mopar. If we learned anything at all during our Hemi versus Stage I Shootout, it's this: If you pull alongside an old man driving a Buick GS with Stage I emblems on the fenders, don't pick a race unless you can tie him to a big tree first.